Last weekend was hot, Hot, HOT in Carlisle as the Chryslers came to town for the Carlisle Chrysler Nationals! Yes - it was almost 110 degrees! It's too easy to get a speeding ticket with this one! OK, maybe it's not "sweeeeet" - but it's still a Chrysler product! Our Solar project has made some progress! In our last blog post, we showed you the new run-in shed, paddock and the solar equipment after it was delivered. Here are some pictures of the progress this week. The equipment is being installed. The new run-in shed has been painted to match the other buildings on the property. It's time for Bluegrass on the Grass in Carlisle PA. Enjoy some great bluegrass music on the lawn at Dickinson College on Saturday, July 14th. From 1 to 9 PM you can tap your foot, sing along, or just enjoy the Bluegrass Music - all FREE! The weather service promises that it will NOT be 110 degrees this weekend! Sunday, July 15th is National Ice Cream Day! 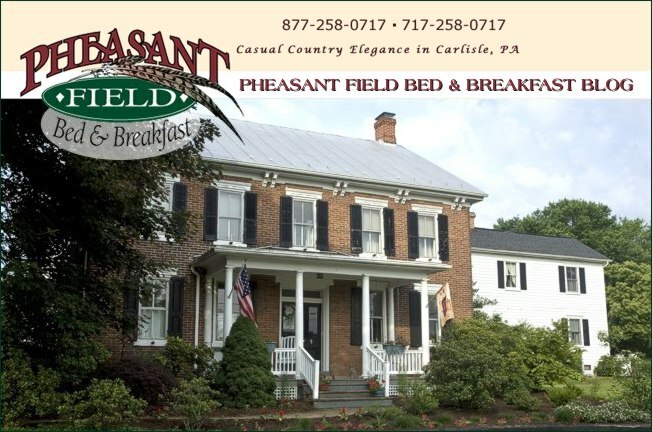 Stay at our bed and breakfast, Pheasant Field B&B, on Sunday night, and get a FREE ice cream cone! There is nothing better than a ice cream cone on a warm summer evening!